High school matriculation completion rates among women were higher than those for men in the past – and have increased markedly in recent years. Children of less-educated parents have shown the highest increases in high school matriculation rates. Access to higher education in Israel requires the successful completion of high school bagrut (matriculation) exams in core subject areas. Due to the central place of the matriculation certificate in the educational system, it has long been a central policy goal both to improve bagrut completion rates for all Israelis and to increase the completion rate among those from less advantaged backgrounds. 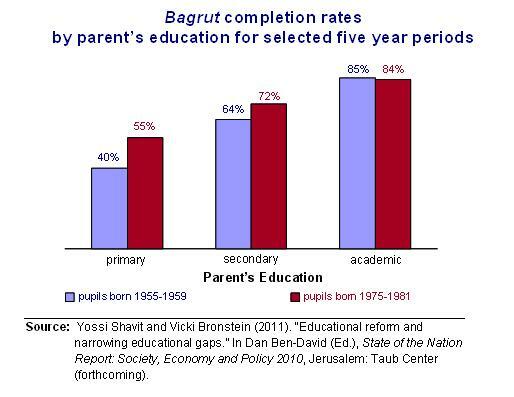 The Chair of the Taub Center’s Education Policy Program, Professor Yossi Shavit joined together with Vicki Bronstein to study the trends in attainment of the bagrut certificates and examine to what extent these goals have been reached. Shavit and Bronstein first look at overall attainment, and find that it has greatly improved in recent decades. 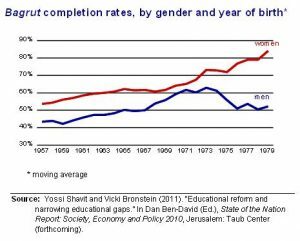 Of Israelis born in 1955-1959, fewer than half ever attained a bagrut certificate; for those born in 1975-1981, the rate is over 70 percent. In order to examine if disadvantaged groups have closed gaps in educational attainments, Shavit and Bronstein looked at bagrut achievement among groups differentiated by various background measures. The first figure shows how successful completion of bagrut (matriculation) exams changed over time for three groups: those with parents having only primary education; those with parents having a secondary education (some high school); and those whose parents have a college education. In Israel, as in other countries, educational achievements of children are highly correlated with the education levels of their parents – the higher the parents’ education, the greater the likelihood that children will graduate from high school. But over time this gap has been greatly narrowed in Israel. The figure shows that children with the least educated parents showed the greatest improvement. Children in the middle group, whose parents had a secondary education, showed a lesser but still substantial increase. Among the children whose parents hold academic degrees, there was no increase at all in bagrut rates. Another aspect of inequality in high school graduation rates is that between Jewish and Arab Israelis. 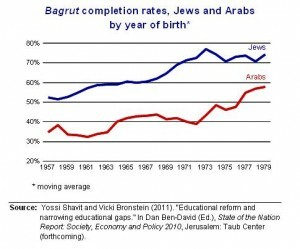 The second figure shows trends in bagrut rates for both Jews and Israeli Arabs over a period of more than twenty years. (Because year to year changes can be very sharp, the graph shows a moving average of five consecutive years.) The gap between those born in the late 1950s was about 15 percentage points; virtually the same gap is found between those born in the late 1970s. 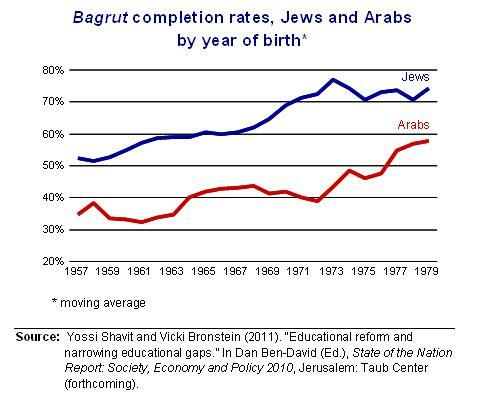 The bagrut attainment of Israeli Arabs has greatly improved, but it has not come closer to that of Israeli Jews. The pattern that is most striking, and perplexing, is displayed by changes in completion rates among men and women (see third figure). Already among those born in the late 1950’s, women attained bagrut certificates at a much higher rate than men. Almost 55 percent of women in that age cohort received a bagrut, compared to roughly 45 percent among men. But the men did not close the gap, as did the children of uneducated parents, nor was there even a parallel improvement, as was the case of Israeli Arabs relative to Jews. Instead, starting among men born in the middle 1970s there was a pronounced and persistent drop in bagrut rates over a period of years, even as women continued to increase their completion rates. As a result, the gap between men and women widened from about 10 percentage points to about 30 percentage points. 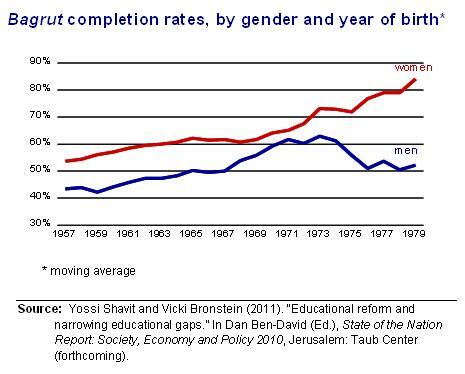 The widening gender gap is especially marked among Arab Israelis. Over this period Arab men moved from a 15 percentage point advantage in completion rates over women to a 15 percentage point disadvantage – a total swing of about 30 percentage points in bagrut attainment. Shavit and Bronstein consider various explanations for this phenomenon, which they conclude needs more attention than it has merited so far. While pupils with less educated parents did narrow the bagrut attainment gap with peers born to more educated parents, Shavit and Bronstein did not find evidence of a parallel narrowing of educational gaps with regard to attainment of university or college degrees. These students did see an increase in the percentage obtaining degrees, but the improvement was similar to that found among the students from more educated households. The full article of Shavit and Bronstein will appear in Taub’s forthcoming State of the Nation report.